Colorful Autumn leaves decorate the floor of the forest trail on the way to Ragged Falls in Oxtongue River-Ragged Falls Provincial Park in Ontario, Canada. The trail through the forest to Ragged Falls in Oxtongue River-Ragged Falls Provincial Park in Ontario, Canada is beautiful during the Autumn season. The forest is an array of colorful hues as each tree slowly turns eventually leaving the trees bare and the trail beautiful. This is a very peaceful stroll amongst the wilderness ending up at Ragged Falls. Fall scenery along the trail to the Ragged Falls in the Oxtongue River-Ragged Falls Provincial Park, Ontario, Canada. 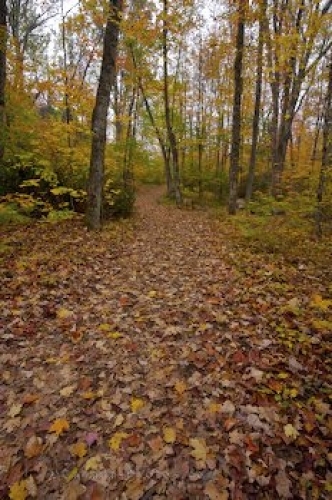 Picture of the colorful Autumn forest trail to Ragged Falls in Ontario, Canada.